I wake up early, and Volendam is already docked in Honolulu harbour at Pier 11, right beside the Aloha Tower. My friends and I thought we could catch a free shuttle to Waikiki, but instead have to take a taxi to pick up our rental car for the day. This is a hassle and delays us a bit, but eventually we are off on our self-guided tour around Oahu. We head out to Diamond Head, but after paying to get inside the crater, find out it is an hour and a half hike to the top and return. We don’t have time for this, so we don’t stay long. 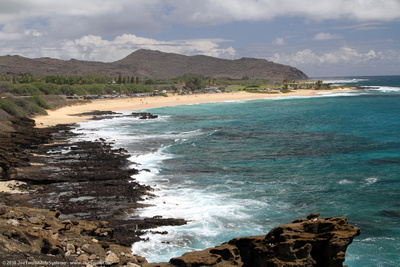 We drive a bit further to see Hanauma Bay – a very pretty coastal location where there is lots of coral growing. It is very popular for swimming and snorkelling and costs $14.50 to go down to the shore and use the beach, but only a $1 to park and look around. We do the latter and then move on to Koko Heads – another spectacular sight – a blowhole and beautiful shoreline along the south coast of Oahu. As we head north to the eastern shore of Oahu, it starts to rain. The vegetation is more tropical of course…the south shore is like a desert in comparison. The coastline around the Kaneohe area is very pretty, and the mountains are deeply grooved similar to the Napali Coast on Kauai. I guess the same processes are at work since they are both north-facing coasts – wind and water erosion. We have lunch at the Crouching Lion Bar & Grill in Kaaawa (now closed), and then head back to Waikiki to return the rental car and get back to the ship. Volendam departs Honolulu at about 11pm, bound for Kailua-Kona and the Big Island of Hawai’i on a slow overnight cruise. We have a lovely dinner in the Rotterdam Dining Room this evening. 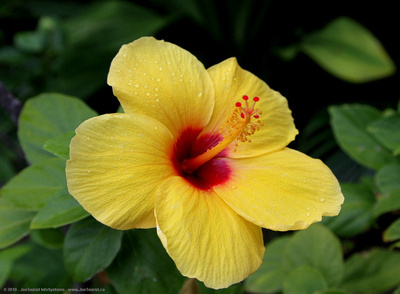 This entry was posted in Hawaii, USA and tagged beach, coastline, flowers, island, mountains, snorkel. Bookmark the permalink.